The Battle of Es Sinn was a military engagement during the Mesopotamian Campaign of World War I. The battle was fought to determine control of the lower Tigris and Euphrates rivers in what is now Iraq. It was also viewed, by the British and Indian governments, as a test of the Turkish forces and whether a further advance to capture Baghdad was possible. 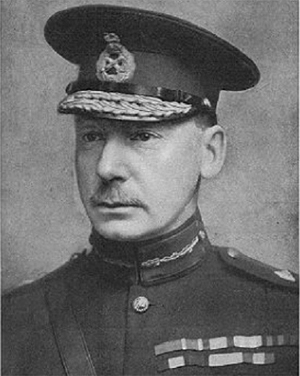 The battle took place on 28 September 1915 between Anglo-Indian forces of Indian Expeditionary Force D, under the command of Major-General Charles Vere Ferres Townshend, and Ottoman forces commanded by Colonel Nureddin. The engagement took place just south of the town of Kut-al-Amarah, along the banks of the Tigris River. Following a night march, the British and Indian troops defeated the Ottoman forces, driving them from their defensive positions along the Tigris. 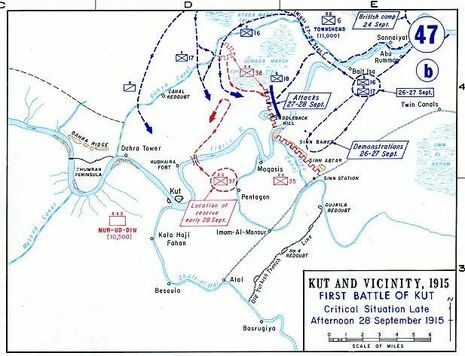 The capture of the Es Sinn position allowed for the capture of Kut, and with it control over the lower Tigris and Euphrates rivers, by British forces the following day. The British capture of Kut-al-Amara - also known as the Battle of Es Sinn, named after the area in which it was fought - followed rapidly on the heels of the former's capture of the major Turkish supply base of Nasiriyeh in July 1915.